Why do you watch it? 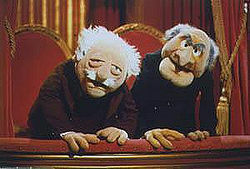 Statler and Waldorf is a pair of Muppet characters. They are two ornery, disagreeable old men. Despite constantly complaining about the show and how terrible some acts were, they would always be back the following week in the best seats in the house. At the end of one episode, they looked at the camera and asked: “Why do you watch it?”. This is a bit like blogging about data quality, isn’t it? Always describing how bad data is everywhere. Bashing executives who don’t get it. Telling about all the hard obstacles ahead. Explaining you don’t have to boil the ocean but might get success by settling for warming up a nice little drop of water. Despite really wanting to tell a lot of success stories, being the funny Fuzzy Bear on the stage, well, I am afraid I also have been spending most time on the balcony with Statler and Waldorf. So, from this day forward: More success stories. This is the start of a series of 1.3 blog posts…. No, just kidding. Previous Article Did They Put a Man on the Moon?